Good for unlimited travel on any fixed route bus for 30 days from date activated. Half fare riders must display their original Medicare, SweetHART, valid drivers licence proving age or CT State issued elderly/disabled ID card to the driver. Reduced fare - Students must display their school ID card to the driver. Please allow 2-3 weekdays for your pass purchase to arrive by mail. Good for 10 rides at a discounted rate. The pass has no expiration date. Please specify if you are a shuttle rider: 10-ride swipe passes cannot be used on shuttles buses. Riders will receive a Fixed Route Punch Pass good for 10 One-Way Rides. 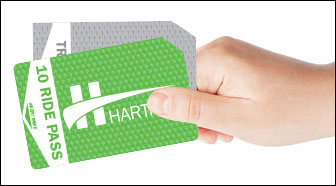 Fixed Route and SweetHART passes can be purchased at the HARTransit office, 62 Federal Road in Danbury, 8:30am-4:30pm Monday-Thursday and 8:30am-1:00pm on Fridays. Fixed Route passes can also be purchased with cash or check at the Pulse Point, 3 Kennedy Ave. in Danbury, 7 am- 9 am Monday-Friday. See below to find out how to apply for SweetHART. A farebox is mounted at the front of the bus near the driver. Please use the exact fare; the operator can not make change. Please do not place your fare in the driver’s hand. The fare box accepts U.S. coins and up to 5 dollar bills. Exact change required when using cash on bus. Transfers are issued FREE at the Pulse Point to passengers who wish to use a second bus to reach their destination. To obtain a transfer, passengers must ask the driver as they board their first bus. Transfers are valid for immediate use as stamped. You may transfer for free from a HARTransit bus arriving in Norwalk to the WHEELS system, CT TRANSIT or the Coastal LINK. WHEELS tokens are accepted as fares on 7 LINK buses. Free transfers are provided to the BeeLine system in Katonah, NY and the PART system in Brewster, NY. Half fare riders must display their original Medicare, SweetHART, or CT State issued elderly/disabled ID card to the driver.